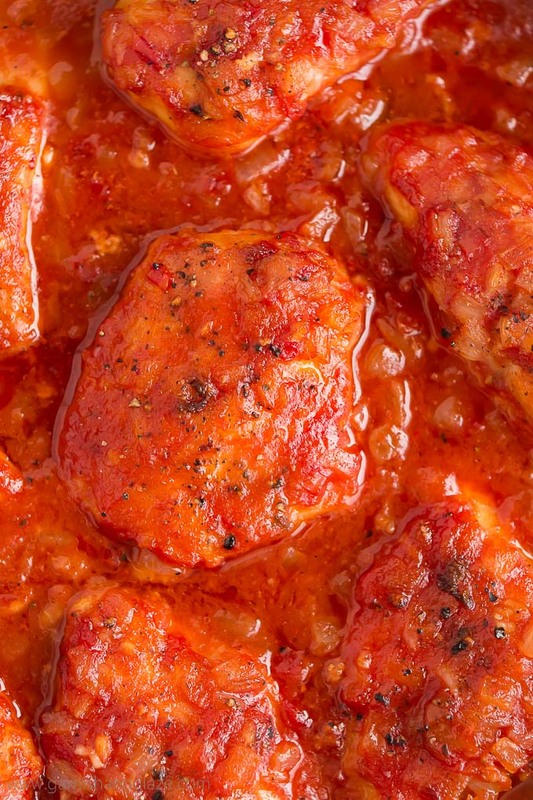 Tender and juicy Napa Valley Chicken is baked in a sweet and savory tomato, onion, and garlic sauce. This is sure to become a family favorite! Napa Valley Chicken is one of my very favorite chicken dishes from my childhood. It’s so flavorful, easy to throw together, and always turns out so tender and juicy. This Napa Valley Chicken dish is made with just a few simple ingredients and is easy to throw together. Serve it over rice with a spoonful of the yummy sauce and a side of steamed broccoli or asparagus and you’ve got an awesome healthy meal for the family. I have a distinct memory of coming home after a field hockey game and eating a big plate of this yummy chicken and rice and feeling so grateful my mom always made us such good meals. You’ll first start out by seasoning the chicken with salt and pepper and then dredge it in flour. Next, you’ll brown both sides of the chicken in oil in the bottom of a large pot. This takes about 2 minutes per side. At this point you can start to preheat the oven to 350 degrees F.
To avoid dirtying more pans, remove the chicken from the pot and set on a plate. Then you’ll add it a couple more tablespoons oil and the onions, cooking them until tender. You’ll finish making the sauce by adding in the garlic, wine (If using. I don’t use it. ), chicken broth, brown sugar, and crushed tomatoes. Bring the sauce to a boil and then add the chicken back in. 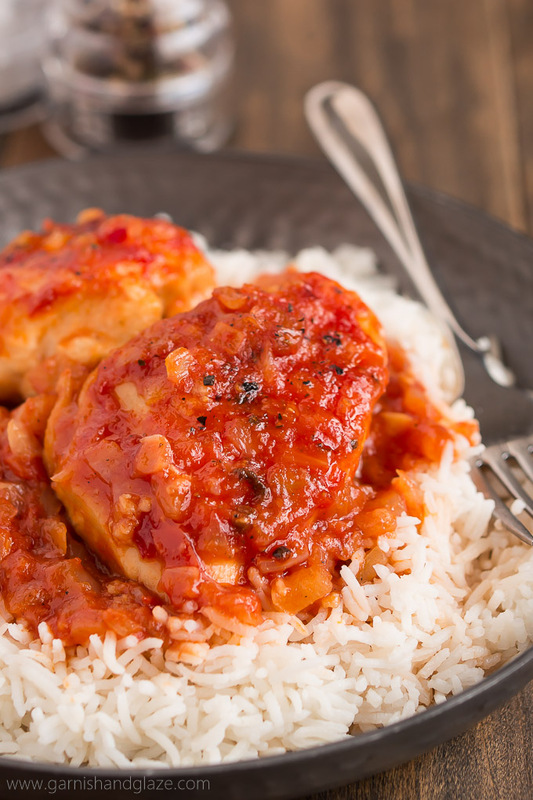 You’ll want to makes sure all the chicken is submerged in the sauce. Pop the pot into the oven and let it bake for 40-50 minutes until the chicken is done and the sauce is slightly thickened. While the chicken is baking, make the rice and any side dishes. I highly recommend eating this chicken over rice. We like white rice but you can definitely use brown rice if you want to get in more whole grains. For a side, I usually make green beans, asparagus, or a side salad. All of these are really simple and healthy. If you don’t keep alcohol in your home you can substitute the 1/2 cup wine for 1/2 cup more chicken broth. This is actually how I’ve always made it and we love it! You can also substitute tomato sauce or tomato puree if you don’t have a can of crushed tomatoes on hand. The recipe has evolved a little over the years. For example, the original recipe had wine in it, hence the name of the dish, but my family doesn’t consume alcohol so we always made it with just chicken broth and it is so good! But make it whichever way you choose. 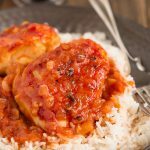 If you’re looking for more awesome chicken recipes try Chicken Francais or Farmers Market Chicken. Pot & Skillet Set– These are the skillets and pots I use. They have a heavy bottom making them sturdy and cook the food evenly. I use these multiple times a day. I use the large 4 quart one for this recipe. 9×13 Inch Casserole Dish with Lid– This is my go-to casserole dish. If you don’t have an oven proof pot, this is perfect for baking the chicken it. It’s also perfect for casseroles, cakes, brownies, and more. I love that this one has a lid for easy storage in the fridge. Heat 3 tablespoons oil in an oven safe pot over medium-high heat. Sprinkle chicken with salt and pepper and then dredge in flour. Place in the pot and brown on both sides (about 2 minutes per side). Add 2 tablespoons oil to the pot and saute the onion until soft and translucent. Add the garlic and cook 30 more seconds. Add the chicken broth, tomatoes, wine, brown sugar, and salt. Bring the sauce to a boil and then add the chicken back in. Make sure all the chicken is submerged. (If your pot isn't heat safe, you can place the chicken in a 9x13 inch pyrex dish, pour the sauce on top.) Bake for 40-50 minutes. 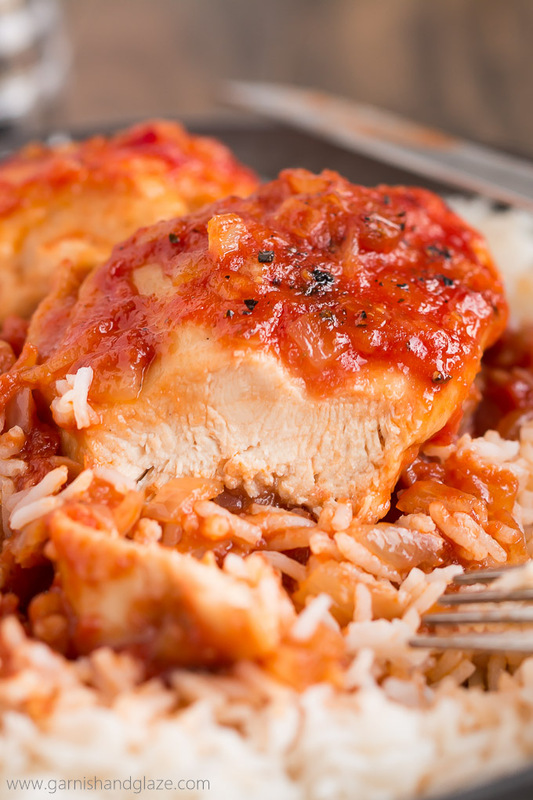 Serve chicken and sauce over white or brown rice. *1/2 wine can be substituted for 1/2 cup chicken broth. THIS. WAS. AWESOME!! I made it last night! Adding it to my repertoire. Thank you Melanie! Yay!!! I’m so glad you loved it Brigitte! Sorry I missed this! Yeah, do NOT cover. You want the liquid to be able to thicken so leave it uncovered. Making this right now it smells delicious!! I used cheese tortellini to go with it!! Was this spagnollos wife ? I am curious who the coach was, as I am also a former Rams fan😒! But a really cool backstory!!!! Made this tonight – very good! We were out of wine, so I added a ‘sploop’ of balsamic vinegar for brightness and added a couple of other things as I think I got carried away with the brown sugar. It carmelizes in the oven, and wow…is it YUMMY. Served it over orzo. Thank you! What white wine did you use in this recipe? I don’t use wine when I make it (we don’t have alcohol in our home) but I’d recommend a white wine. Hi, I have a question. Do you think this could be finished in a crock pot? And if so how long? Rachel, Yes! I actually just tried cooking it in the crock pot like a month ago. 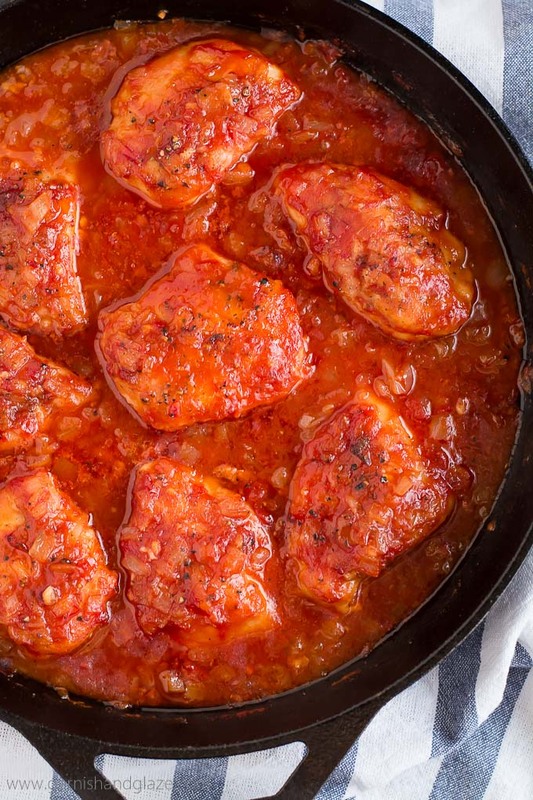 You’ll want to omit the 1/2 cup wine and cook on low for 2-3 hours or until chicken is to 165 degrees F. If the sauce isn’t thick enough for you at the end you can mix 1 teaspoon cornstarch with 1 teaspoon water and cook it without the lid and on high for the last 20-30 min. Im making it now. Smells amazing! I cooked mine in the oven…it was amazing!! However, I expected the sauce to be a little thicker. Any suggestions? Thank you!! Did you cook it uncovered? It should have thickened up a bit. But next time you can put less chicken broth or simmer the sauce for a little bit before pouring it over the chicken and baking. Very enjoyable but, did make a few changes/additions. Browned chicken 1st, no need to dirty 2 pots. To onions added diced carrots and sautéed. Added garlic and celery cooked for a couple then added 1 diced pasilla and 1 red bell. Seasoned with TJ’s 12 seasoning and herb de Provence. Also instead of wine used vermouth. Added chicken back in and simmered stove top. About 10 minutes prior to serving added chopped fresh green beans and quartered mushrooms. Served with orzo. Very lively and flavorful. Next time will also add paprika. Great recipe to experiment with. Excellent recipe but did make a few changes/additions. Browned chicken 1st., no need to dirty 2 pans. To onions added diced carrots and sautéed. Added garlic and celery cooked for a couple then added 1 diced pasilla and 1 red bell. Seasoned with TJ’s 12 seasoning and herb de Provence. Also instead of wine used vermouth. Added chicken back in and simmered stove top. About 10 minutes prior to serving added chopped fresh green beans and quartered mushrooms. Served with orzo. Very lively and flavorful. Next time will also add paprika. Great recipe to experiment with. I love this recipe, but would never cook tomatoes in cast iron as shown, I used my large stainless steel pan. Love this recipe! A keeper! Thanks for sharing! This is one of my family’s favorite recipes! Everyone I make it for loves it!